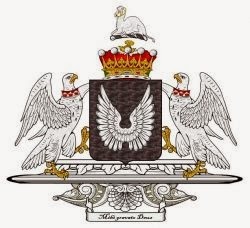 This is a Scottish family of great antiquity, which has enjoyed a Scottish baronetcy since 1625. The earliest surname under which the family of COLQUHOUN can be traced is that of Kilpatrick. Sir John Colquhoun of Luss was a descendant of Umphredus de Kilpatrick. That patent was resigned, however, in 1704, by Sir Humphrey Colquhoun, 5th Baronet, upon condition of its being renewed to his son-in-law, James Grant (1679-1747), who thereafter assumed the name of Colquhoun. SIR JAMES COLQUHOUN (1714-86), the eighth successor to the patent of 1704, was created a baronet in 1786. SIR JAMES COLQUHOUN (1741-1805), 2nd Baronet, of Luss, Dunbartonshire, who married, in 1802, Janet, daughter of Sir John Sinclair Bt, of Ulbster. ROSSDHU HOUSE, near Luss, Dunbartonshire, was built in 1773 to replace a castle the Colquhouns had lived in since the 15th century. In 1772, (Sir) James Colquhoun had begun to build the present house, which was originally what is now the central block, and completed it in the following year. Later that year, the celebrated Dr. Johnson and Mr. Boswell were entertained at Rossdhu on their renowned tour of the Hebrides. His son, Sir James, 2nd Baronet, was a friend and correspondent of Horace Walpole, to whom he gave a goat's horn snuff-mull, was a connoisseur and collector of paintings, landscapes in particular, engravings, ancient coins and rare old china. The 3rd Baronet lived with discernment during the good taste of the Regency: He enlarged the house, adding two wings and the portico, using the stone from the old castle. Sir James made the long south drive along the lochside, and built its two superb entrance lodges joined by a beautiful archway surmounted by the Colquhoun heraldic emblems, that form together an architectural gem on the side of the main road. Draining the marshy "moss" that had guarded the landward side of the castle in the Middle Ages, but was no longer needed to protect the house, Sir James turned it into a deer park and enclosed the policies within a park wall. Sir James, 4th Baronet and 28th Chief, tragically drowned in Loch Lomond in 1873. He was Lord Lieutenant of Dunbartonshire, as was was his son, Sir James, 5th Baronet, who was visited at Rossdhu by Queen Victoria in 1875. The 5th Baronet's second wife inherited and sold many of Rossdhu's ancestral treasures when he died in 1907 and was succeeded by his cousin Sir Alan, 6th Baronet and 30th of Luss, KCB (1838-1910). The Colquhouns signed a 100-year lease for the Estate - to be made into a golf course - to Tom Weiskopf's design, with Rossdhu serving as the Clubhouse. Loch Lomond Golf Club opened in 1994, and has hosted the revived Scottish Open for a number of years. The Colquhouns only moved a few hundred yards closer to Luss, to take up residence in the former Rossdhu dower house at Camstradden. The Luss Estate today extends to some 45,000 acres. First published in December, 2013. JOHN ALLEN, the founder of this family in Ireland, settled there some time towards the close of ELIZABETH I's reign. He came from Holland to Dublin as factor for the Dutch merchants (the family had emigrated from England to Holland in 1580), and beside amassing a very large fortune, distinguished himself by a refined taste in architecture. Mr Allen was greatly esteemed, and consulted by the most eminent of the nobility and gentry in their buildings; particularly by the Earl of Strafford, Lord Lieutenant of Ireland, in his large, intended edifice near Naas, County Kildare. He laid out the plan of his own house at Mullynahack, near Dublin, leaving it to be executed by his son. 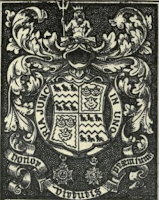 SIR JOSHUA ALLEN, an eminent and opulent merchant of Dublin, who served the office of Lord Mayor of Dublin in 1673, and received the honour of knighthood. Sir Joshua completed the house at Mullynahack begun by his father, called "Allen's Court." THE RT HON JOHN ALLEN (1660-1726), Privy Counsellor, High Sheriff of County Dublin, 1691, MP for County Dublin, 1692-3, County Carlow, 1695-9, County Dublin, 1703-13, County Wicklow, 1713-14, County Dublin, 1715-17. Richard, father of the 4th and 5th Viscounts. He was elevated to the peerage, in 1717, as Baron Allen, of Stillorgan, County Dublin, and VISCOUNT ALLEN, County Kildare. JOHN, 3rd Viscount (1713-45), MP for Carysfort, 1733-42. This nobleman being insulted in the public streets by some disorderly dragoons, in 1742, received a wound in the hand, which occasioned a fever and caused his death soon afterwards. JOSHUA WILLIAM, 6th Viscount (c1782-1845), a military officer, who served under the Duke of Wellington in the Peninsular Wars. His lordship died unmarried, when the title expired. 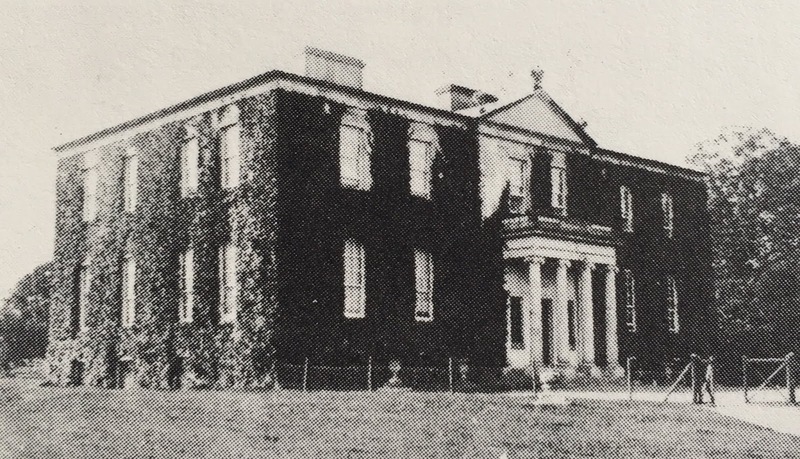 STILLORGAN HOUSE, Stillorgan, County Dublin, was begun in 1695 by John Allen MP, afterwards 1st Viscount Allen. It comprised a two-storey, seven-bay centre block, and single storey, seven-bay wings. The house had dormered attics and high-pitched roofs. The centre block had lofty, slender chimneys, two at each end. The demesne had formal gardens, an obelisk, and a grotto by Sir Edward Lovett Pearce. The mansion was demolished in 1860 and only the grotto and obelisk remain. 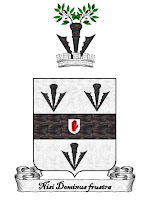 Allen arms courtesy of European Heraldry. THE BANK BUILDINGS, ONE OF BELFAST'S MOST ICONIC BUILDINGS, WAS ENGULFED BY A CATASTROPHIC FIRE ON THE 28TH AUGUST, 2018. The Bank Buildings, Castle Place, Belfast, stand between Castle Street to the south, and Bank Street to the north. 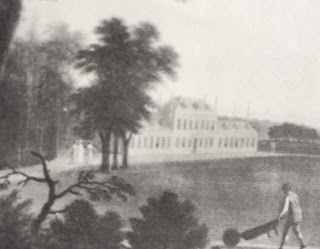 The first building on the site (originally part of the grounds of old Belfast Castle) was designed by Robert Taylor and erected by Waddell Cunningham in 1785. Cunningham, one of Belfast's most prominent business men, opened the premises as a bank in 1787. Following the bank's collapse in 1789, the building was used as the residence of the Lord Bishop of Down and Connor, the Rt Rev Dr William Dickson. In 1804, it was converted into a shop and, in 1816, the last public execution was carried on its doorstep. 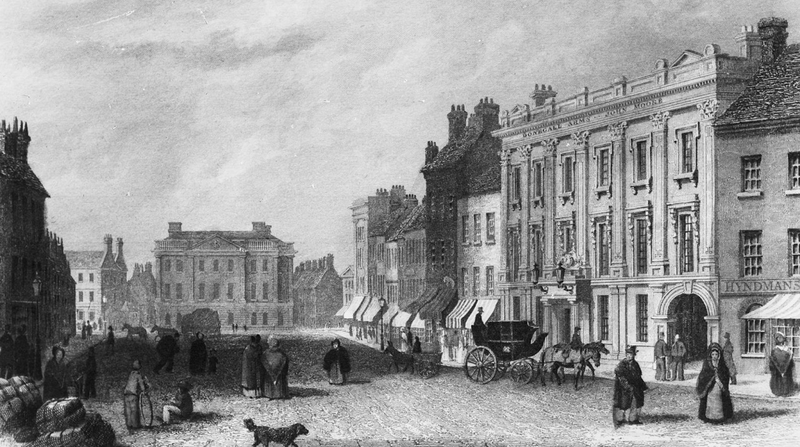 The Northern Banking Company purchased the Bank Buildings in 1825 for use as their head office. 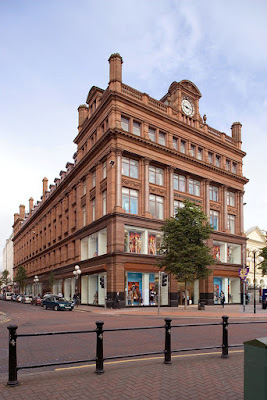 In 1853, William Robertson and Henry Hawkins from Waterford, J C Ledlie from Cork, and Robert Ferguson, of Belfast, established a wholesale drapery firm, which soon became a commercial department store in the city. The old Georgian edifice was demolished and a four-storey, seven-bay Italianate building of 1855 was erected in its place by Hawkins, Robertson and Co. The History Hub Ulster has written an article about the history of The Bank Buildings, including a rare image of the second building built in 1855. W H Lynn designed the new bank buildings in 1900. He intended it as a bridge to the 20th century, with a compromise between the classical style of the upper part of the building and the great expanse of plate glass below. Old photographs show a statue directly above the clock, and a coat-of-arms at third floor level. "I have a photo of Bank Buildings which I took around 1980 and there is no sign of the statue then, whereas there is a Hogg one perhaps of 1930 which does show it (a couple of winged cherubs holding a torch). It could have gone with the bomb damage in 1975 or the subsequent renovations. 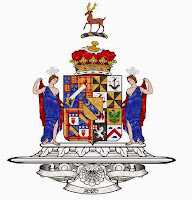 The coat of arms doesn’t show in the Hogg photo so it must have gone early on..."
In fact Robertson, Leslie, Ferguson and Co were royal warrant holders to Queen Victoria. 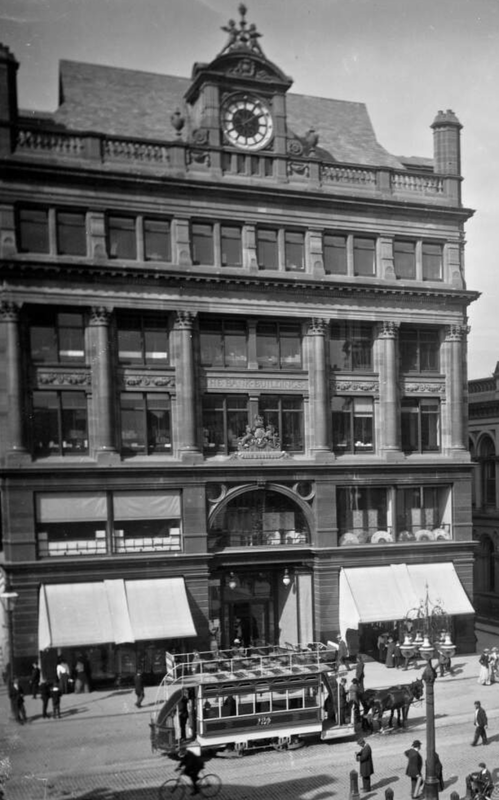 Until 1961, only the ground and first floors were used as a retail store, with the remainder of the building taken up by the company’s wholesale warehouse. In that year, however, the Bank Buildings underwent total renovation. The new arcade shop front was lighted at night, and a modernised main entrance was added at Castle Place (or Junction, as it was known when trams operated). The old pillars and showcases on the ground floor were removed. In 1969, the shares of Robertson, Ledlie, Ferguson and Company were sold to the House of Fraser group, whose chairman was Sir Hugh Fraser Bt. 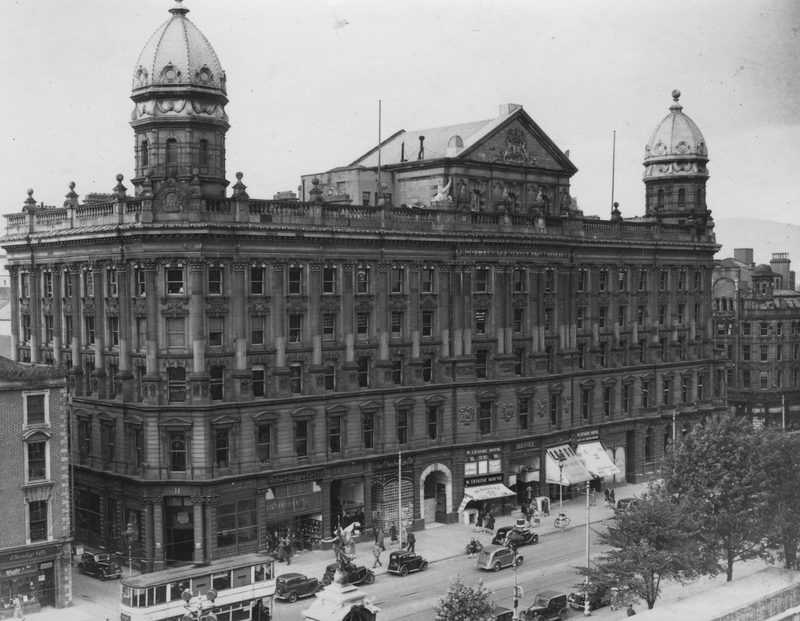 It was hoped at the time that the Bank Buildings would benefit from the knowledge and resources of a large national firm, expanding throughout the United Kingdom. Robertson, Ledlie, Ferguson and Co, however, continued to operate the store as a subsidiary company, and only four years later, Boots acquired the Bank Buildings when it took over House of Fraser. On the 9th April, 1975, three bombs exploded in the Bank Buildings. A huge fire broke out shortly afterwards and damaged parts of the building. In 1979, the Bank Buildings were taken over by the Dublin-based group Primark. Within 18 months, the store was totally refurbished and the exterior restored to its 1903 glory. A catastrophic fire engulfed the Edwardian building at about 11am of the 28th August, 2018. The blaze lasted for a number of hours, leaving it a roofless, gutless shell. It is hoped that the fabric of the building can be saved and fully restored. SIR WALTER SCOTT (1565-1611), Knight, a descendant of Sir Richard le Scot of Murthoxton (now Murdostoun), in Lanarkshire; a powerful chieftain, and a military commander of renown in the Netherlands under the Prince of Orange, was created, in 1606, Lord Scott of Buccleuch. WALTER, 2nd Lord, was, in 1619, elevated to the dignity of Earl of Buccleuch. MARY, became Countess of Buccleuch. ANNE (1651-1732), who wedded the unfortunate Duke of Monmouth, illegitimate son of CHARLES II. In 1663, Their Graces were created DUKE AND DUCHESS OF BUCCLEUCH, Earl and Countess of Dalkeith, and Baron and Baroness Whitechester and Eskdale, with remainder to their heirs male. The English honours of the Duke of Monmouth, Earl of Doncaster, and Baron Tindale, as well as his Scottish dukedom of Buccleuch, were forfeited upon the execution of that unhappy nobleman for high treason. The peerages enjoyed by the Duchess, however, in her own right (Duchess of Buccleuch), were not affected by the attainder. The offspring of this union were James, Earl of Dalkeith, and Henry, created Earl of Deloraine, Viscount Hermitage, and Baron Scott, in 1706, which titles expired with the 4th Earl in 1807. FRANCIS, 2nd Duke (1695-1751), son of Lord Dalkeith. His lordship obtained a restoration of the earldom of Doncaster, and barony of Scott, of Tindale, in 1743. He wedded, in 1720, Lady Jane, eldest daughter of James, 2nd Duke of Queensbury, by whom he had issue, a son, and three daughters who died unmarried, with Francis, Earl of Dalkeith, who died in the lifetime of his father, but left a son, Henry, and a posthumous daughter by his countess, Caroline, eldest daughter and co-heiress of John, Duke of Argyll. The Duke of Buccleuch married secondly, Miss Powell; by whom, however, His Grace had no issue. 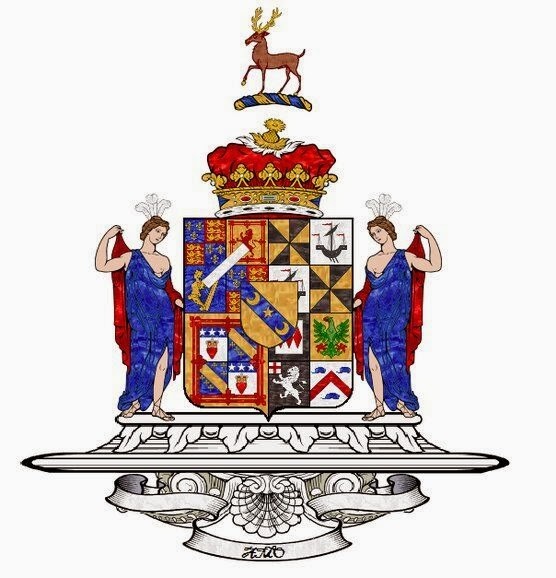 Heir apparent: Walter John Francis Montagu Douglas Scott, Earl of Dalkeith (b 1984), elder son of the 10th Duke. 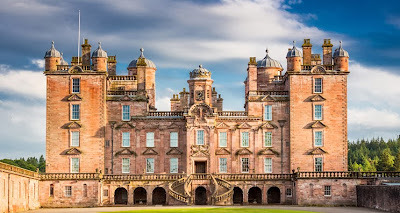 Seats ~ Bowhill, Selkirk; Boughton House, Kettering; Drumlanrig Castle, Thornhill, Dumfriesshire. The Dukes owned a further 17,965 acres of land in Northamptonshire. DRUMLANRIG CASTLE, Thornhill, Dumfriesshire, was built in the late 1600s by William, 1st Duke of Queensbury, on the site of the former 14th & 15th century Douglas stronghold. The present Castle was created as a mansion in the 17th century, by which time defensive ramparts had given way to comfortable living and large, airy windows. An earlier, more defensive castle had been built in the middle of the 14th century by the Douglases. Drumlanrig is built of local pink sandstone on a hill (Drum) at the end of a long ridge overlooking the Nithsdale Hills and the valley of the river Nith. It was rebuilt with a central courtyard and was in a good enough state to receive JAMES VI on his visit to Scotland in 1617. Between 1679-91, William, 3rd Earl of Queensberry (later 1st Duke) built a new, large mansion, following the earlier courtyard layout. Despite almost bankrupting himself as a result of creating his new home, the Duke spent only one night in the building, decided he didn't like it - and returned to Sanquhar Castle. His son, however, moved in after inheriting the title and estates. Bonnie Prince Charlie spent a night there on his retreat from Derby. After being allowed to become derelict in the 18th century, Drumlanrig passed to the Duke of Buccleuch, head of the Scott family, in 1810, following a merger of the Douglas and Scott dynasties. The castle was restored in 1827 and is still the Dumfriesshire home of the Duke of Buccleuch and Queensberry (though his main residence is at Bowhill House in the Scottish Borders). It is also home to part of the internationally renowned Buccleuch Art Collection. featuring such treasures as Rembrandt’s The Old Woman Reading as well as many other fine paintings, tapestries and objects d’art. Grand reception rooms, magnificent staircases and ornate period features sit happily beside cosy parlours and the Stableyard, now housing the Stableyard Studios and Stableyard Cafe. First published in November, 2013. Buccleuch arms courtesy of European Heraldry. I, King William, in the third year of my reign, give to Paulinus Rawdon, Hope and Hopetown, with all the boundaries both up and down, from heaven to earth, from earth to hell, for you and your heir to dwell, as truly as this kingdom in mine; for a crossbow and an arrow, when I shall come to hunt on Yarrow; and in token that this thing is true, I bite the white wax with my tooth, before Meg, Maud, and Margery, and my third son, Henry. This Paulinus, or Paulyn, commanded a band of archers in the Norman invading army, and derived his surname of RAWDON from the lands of that denomination, near Leeds, which constituted a portion of the royal grant. GEORGE RAWDON (1604-84), only son of Francis Rawdon, of Rawdon, who settled in Ulster, and took an active part, as a military commander, during the Irish rebellion of 1641; and subsequently, until his decease, in 1684, in the general affairs of that Province. 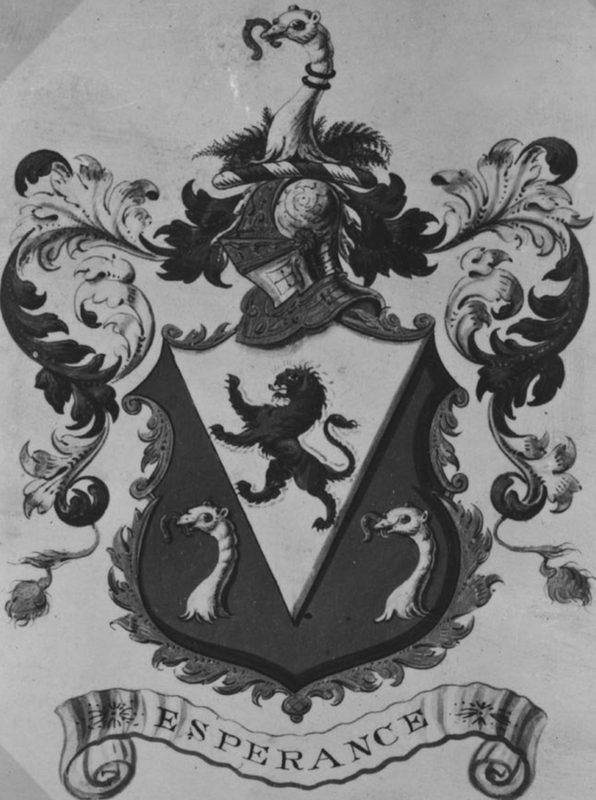 Mr Rawdon was created a baronet in 1665, demoninated of Moira, County Down. Sir George married firstly, in 1639, Ursula, daughter of Sir Francis Stafford, of Bradney, Shropshire, and widow of Francis Hill, of Hillhall, by whom he had no surviving issue. SIR JOHN RAWDON (1720-93), 4th Baronet, was elevated to the peerage, in 1750, as Baron Rawdon, of Moira, County Down. His lordship was further advanced to an earldom, in 1762, as EARL OF MOIRA. His lordship espoused firstly, in 1741, Helena, youngest daughter of John, Earl of Egmont, by whom he had two daughters, Catherine and Helena. The 1st Earl married secondly, in 1746, Anne, daughter of Trevor, 1st Viscount Hillsborough, by whom he had no issue; and thirdly, in 1752, the Lady Elizabeth Hastings, eldest daughter Theophilus, 9th Earl of Huntingdon, who inherited the baronies of Hastings etc upon the demise of her brother Francis, 10th Earl of Huntingdon, without issue, 1789. Selina Frances; Charlotte Adelaide Constantia; Anne Elizabeth. FRANCIS EDWARD (1754-1826), 2nd Earl, KG GCB etc, MP for Randalstown, 1781-3, a gallant soldier, an eloquent senator, and a popular statesman. Sophia Frederica Christina; Selina Constance; Adelaide Augusta Lavinia. His lordship inherited, upon the demise of his mother, in 1808, the ancient baronies of Hastings, Hungerford, etc; and was created, in 1816, Viscount Loudoun, Earl of Rawdon, and MARQUESS OF HASTINGS. His lordship had been previously created a peer of Great Britain, 1783, by the title of Baron Rawdon, of Rawdon, Yorkshire. Former seats ~ Donington Hall, Leicestershire; Rawdon Hall, Yorkshire; Loudoun Castle, Ayrshire; Moira, County Down; Montalto, County Down. First published in March, 2011. Rawdon arms courtesy of European Heraldry. This family claims descent from a common ancestor with the BARRINGTONS of Barrington Hall, Essex, raised to the rank of Baronet in 1611. JOSEPH BARRINGTON (1764-1846), who was created a baronet in 1831, denominated of Limerick, County Limerick. 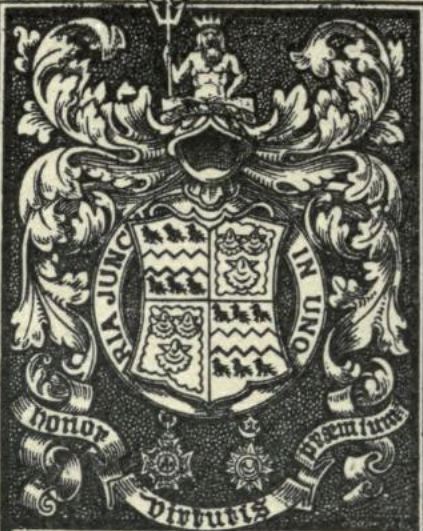 Sir Joseph founded the hospital in Limerick bearing his name, along with his sons. Mary Anne; Charlotte; Jessey; Olivia; Josephine; Henrietta Victorine. 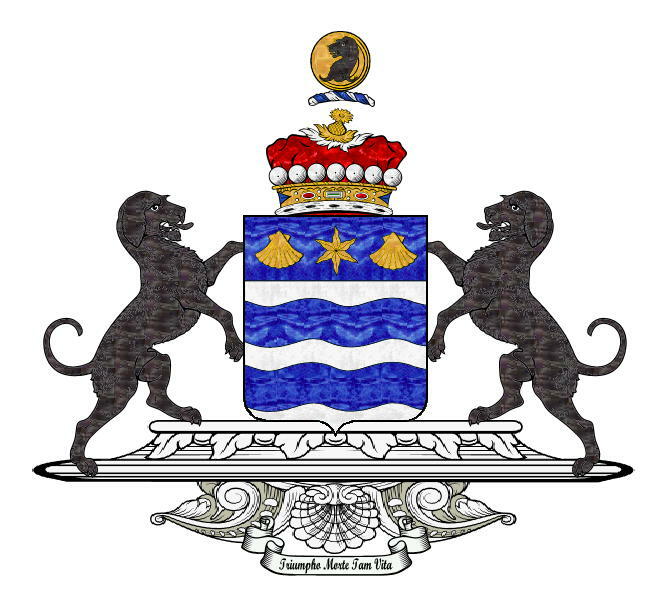 SIR CHARLES BACON BARRINGTON, 6th Baronet (1902-80). It is thought that the present 8th Baronet lives in Canada. GLENSTAL ABBEY, formerly Glenstal Castle, Murroe, County Limerick, is a massive Norman-Revival castle by William Bardwell, of London. It was begun in 1837, though not finished till about 1880. 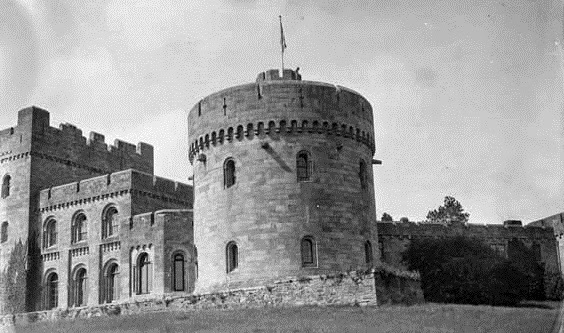 The main building comprises a square, three-storey keep joined to a broad round tower by a lower range. The entrance front is approached through a gatehouse replicated from that of Rockingham Castle, Northamptonshire. The stonework is excellent and there is abundant carving, the entrance door being flanked by the figures of EDWARD I and Eleanor of Castille; while the look-out tower is manned by a stone soldier. The staircase is of dark oak carved with animals, foliage and Celtic motifs, hemmed in by Romanesque columns. The octagonal library at the base of the round tower is lit by little windows in deep recesses; the vaulted ceiling painted with blue and gold stars. The main building faces south, and commands an unbroken view of some thirty miles towards the Galtee Mountains. It is built on a height of some three hundred feet above sea-level, and can be seen from many miles away. Sir Charles and Lady Barrington left Ireland permanently in 1925 and the castle and estate were purchased shortly after by a priest, Monsignor James Ryan, for the nominal sum of £2,000. 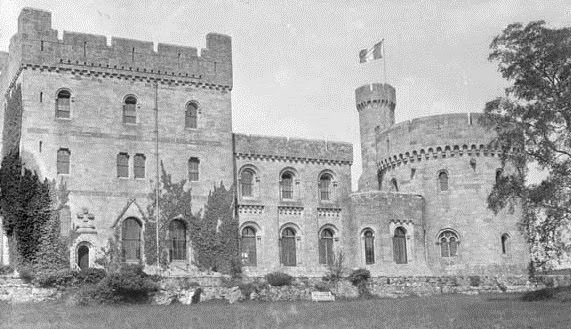 Glenstal Castle, in the parish of Murroe, Co Limerick, was built by the Barrington family in the 1830s. The architect, William Bardwell, designed it in the Norman-Revival style, with a gate-tower, keep, and impressive front façade. The Barringtons had acquired the Carbery estate in 1831, which stretched from the Mulcair River at Barrington's Bridge, to the Clare River on the Limerick-Tipperary Border. In 1870, the estate consisted of 9,485 acres. This holding was considerably reduced, following a series of Land Acts, passed between 1881 and 1909. Thus, by the year 1925, when Sir Charles and Lady Barrington decided to leave Glenstal, they owned less than 1,000 acres, in and around the castle demesne. They were finding it more and more difficult to maintain the castle and estate, especially in the new Ireland, which emerged from the War of Independence and the Civil War (1922-23). One of the main reasons why the Barringtons left Glenstal was the sad death of their only daughter, Winifred ('Winnie'), who was killed in an unfortunate incident in May, 1921. She was travelling in the company of a Black and Tan officer, Captain Biggs, when the car was ambushed by the local IRA unit near Newport, Co Tipperary. Winnie, who was in the front seat of the open car, was shot by mistake, and died that evening in Glenstal. The family was devastated. Lady Barrington, who was a Scot and a Unionist at heart, urged her husband to leave Ireland as soon as possible, and take up residence in England. When eventually, in 1925, the time came to leave, Sir Charles made a mag­nificent gesture. He wrote to the Irish Free State government, offering Glenstal as a gift to the Irish nation, specifically suggesting that it might be a suitable residence for the Governor-General. Mr W T. Cosgrave, the President of the Executive Council of the Irish Free State, and Mr Tim Healy, the Governor-General, visited Glenstal in July 1925, and 'were astonished at its magnificence, which far exceeded our expectations'. However, financial restraints forced them to turn down the offer. Mr Cosgrave wrote to Sir Charles, stating that 'our present economic position would not warrant the Ministry in applying to the Dail to vote the necessary funds for the upkeep of Glenstal'. Soon after this, the Barringtons held an auction of the furniture and books in the castle, and let it be known that they were about to leave Ireland for good. The news soon spread to the village of Murroe, and caused much comment and dismay, as the Barringtons had been a major employer in the area for nearly a hundred years. It would be a local disaster, if the Glenstal demesne and castle were to be abandoned and become a ruin, like so many other big houses in Ireland. There thus began a local campaign to save Glenstal. It should be said that the Barringtons never intended abandoning the place, and kept a skeleton staff in the castle, in the hope that someone might come along to buy it. Some months after the purchase, Msgr Ryan wrote to Celestine Golenvaux, the Abbot of the Benedictine monastery at Mared­sous, and invited him to come to Ireland and set up a daughter house in Glenstal and, by March 1927, the first two Belgian monks had arrived at Glenstal to establish the new house. In 1932, the monks opened a Secondary School. Glenstal is now a Benedictine abbey and a well-known boys' public school. First published in June, 2012. THE SCOTTISH PROVIDENT BUILDING (SPB), Donegall Square West, Belfast, is a grand, symmetrical, multi-bay, sandstone Italianate office block. 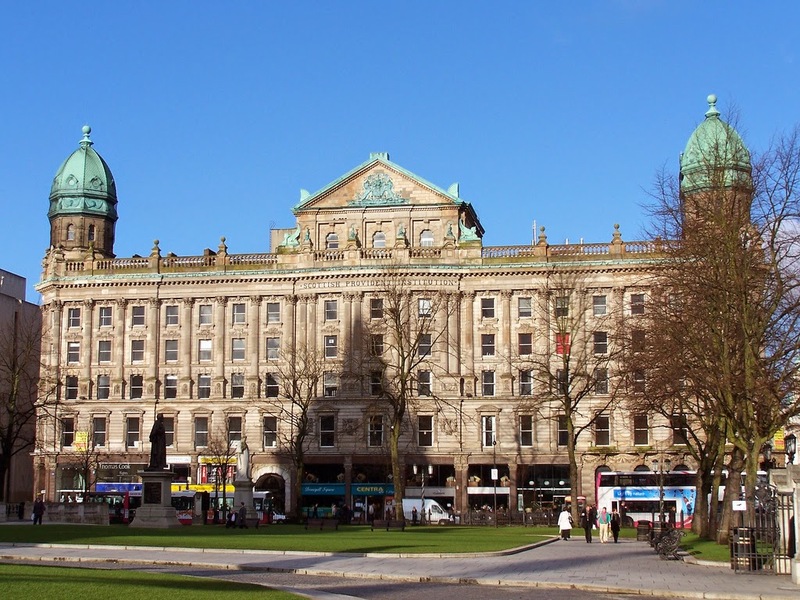 This august edifice directly overlooks Belfast City Hall's western facade and the Lord Mayor's official suite of rooms. It comprises six-storeys over a basement, with an attic-storey; dated 1902, to the designs of Young & Mackenzie. The building is U-shaped on plan with a central pedimented bow and chamfered corner elevations surmounted by octagonal domed pavilions. Retail units are on the ground floor of the building, which was extensively renovated ca 2009. 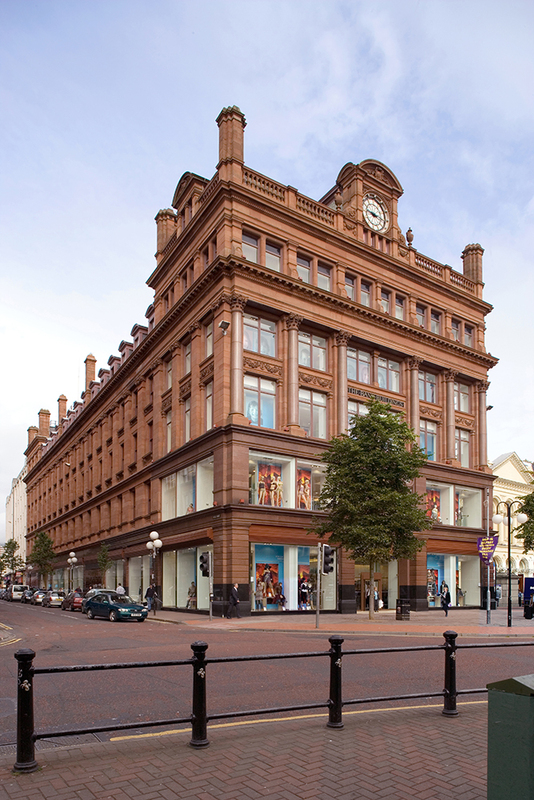 One of the most prominent buildings in Donegall Square, this large-scaled Victorian commercial edifice displays much sculptural stonework to the facade in addition to its copper roof features. The neo-Palladian idiom is loosely interpreted with hints of Baroque and art nouveau. Much historic fabric and detailing survives. The SPB is undoubtedly one of the most impressive late Victorian or early Edwardian structures in the city by notable local architects, representing the commercial development of the city in its later stages. The SPB comprises one of two large office blocks built in Donegall Square to the designs of Young and MacKenzie during the late 19th century. 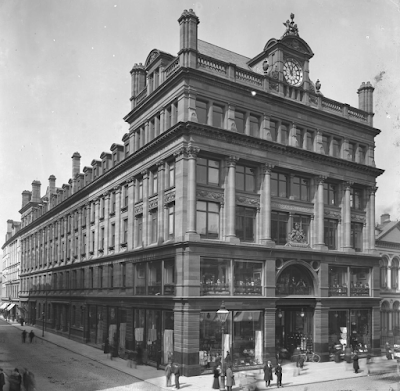 The Royal Linen Warehouse for Robinson & Cleaver was constructed first, on the north of the Square, in 1888, followed by the larger Scottish Provident Institution, built in Donegall Square West between 1897-1902. This site was previously occupied by the offices and yards of linen merchants and the Donegall/Union Hotel. The new building was initially occupied by the Scottish Provident Institution, and a number of offices had been leased to other businesses, including the architects Young & MacKenzie. The ground floor contained a number of commercial units, including McGee & Co, Tailors; Erskine Mayne, bookseller; lantern and photo specialists; and at 8 Wellington Place, J Lizar, which remains there today. The building continues to function with cafes, shops and restaurants on the ground floor; offices and meeting spaces on the floors above. This grand Italian-Renaissance-style building was constructed by the builder Robert Corry, to designs prepared by Robert Young of Young and MacKenzie. Carvings and sculpture were executed by Purdy & Millard; while Ward & Partners created the stained glass in the first floor lobby, which depicts Scottish coat-of-arms. The ornamental sculpture includes detailed carvings of female heads, representing Scotland, Ireland, England, India, Sudan and Canada. The central bay, which bows outward, is also adorned with panels depicting the prevalent industries of the day including shipbuilding, rope making and weaving. 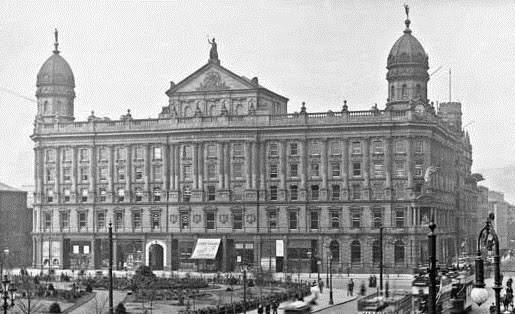 During the late 20th century the stonework was restored, a projecting central canopy was added over the Donegall Square entrance, and some statues were removed from the facade. First published in July, 2014. 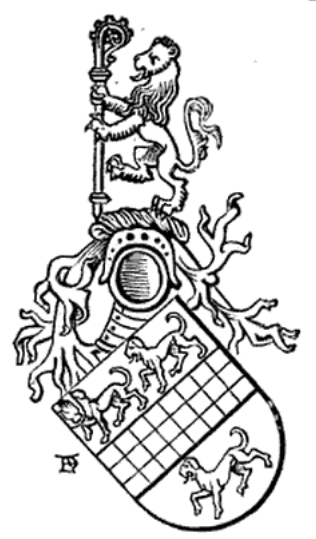 This family, anciently written RIDGEWAY, alias PEACOCK (alluding to which the old bearing of arms was three peacocks' heads erased), had been in Devon from a very early period, as manifested by the collections of Sir William Pole, the best antiquary of that county. The name may be presumed to have been local, there being two places thus called in that county - one near Plymouth; the other in the parish of Owlscomb, near Honiton. JOHN RIDGEWAY (c1517-60), who purchased from the Mohuns of Dunster the Manor of Torre in Devon, and was elected one of the representatives of the city of Exeter in the two parliaments called by Queen Mary. THOMAS RIDGEWAY (1543-98), MP for Dartmouth, 1584, purchased, from Sir Edward Seymour, the site of Torre Abbey, in Devon. Mr Ridgeway employed in Ireland in a military capacity during the reign of ELIZABETH I, and planted the first colony in that kingdom. He was High Sheriff of Devon, 1609, and received the honour of knighthood. At the accession of JAMES I to the throne, he was elected one of the Knights of the Shire for Devon in the first parliament called by that Prince, who continued to employ him in some of the highest places of trust and command in Ireland, and had him sworn of the Privy Council. Sir Thomas was advanced to the dignity of Baronet in 1612, denominated of Torrington, Devon. He was raised to the peerage, in 1616, as Baron Gallen-Ridgeway. His lordship was further advanced, in 1622, to the dignities of EARL OF LONDONDERRY and Viscount Gallen-Ridgeway, of Queen's County. and should set apart convenient places for the site of the town, churchyard, market-place, and public school; he was likewise to assign to the burgesses houses and lands and 30 acres of commons. Sir Thomas received also, in 1611, the grant of a market and two fairs to be held here; and in 1613, the town and precincts, with the exception of a fort and bawn called Spur Royal castle, which had been erected, were created a borough. Besides the 315 acres of land on which he was to found the borough, Sir Thomas received a grant of 2,000 acres called Portclare; and according to Pynnar's report in 1619, it appears that, besides the fort and bawn, he had built 16 houses of stone in the town, which were inhabited by English artificers who were burgesses, and had each two acres of land, and commons for their cattle. ROBERT, 4th Earl, who espoused, in 1686, Lucy, daughter of Sir William Jopson Bt and had two daughters, his co-heirs, viz. LADY FRANCES RIDGEWAY, m Thomas Pitt, EARL OF LONDONDERRY (2nd creation). His lordship died in 1714, when all his honours (including the baronetcy) expired. Tor Mohun, the old Ridgeway estate in Devon, was sold, about 1768, by Lord Donegall to Sir Robert Palk Bt. First published in July, 2012. 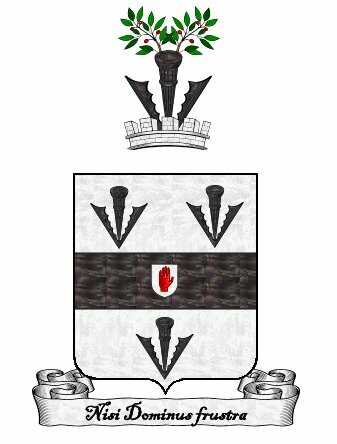 Londonderry arms courtesy of European Heraldry. This family was anciently settled in Cornwall. Mr Warren was created a baronet in 1784, denominated of Warren's Court, County Cork. Elizabeth; Margaret; Charlotte; Esther; Rose Catherine; Frances Augusta; Mary. SIR THOMAS RICHARD PENNEFATHER WARREN, 8th Baronet (1885-1961), CBE DL, Chief Constable of Buckinghamshire, 1928-53. Sir (Brian) Charles Pennefather Warren, 9th Baronet (1923–2006). Sir Philip Digby Somerville-Warren, presumed 10th baronet (b 1948). 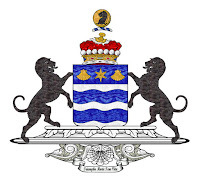 The presumed heir of the presumed 10th baronet is his cousin, Robert Augustus Michael Mary Warren (b 1948). The heir apparent of the presumed heir is his eldest son, Dominic Charles Augustus Warren (b 1979). WARREN'S COURT, near Lissarda, County Cork, was a two-storey Georgian house, with a six-bay pedimented front and single-storey Ionic portico. It had urns at each corner of the roof-line and an eagle stood at the top of the pediment. The side elevations extended to four bays. The mansion was surrounded by a fine demesne with lakes. There were said to be forty rooms, thirty outhouses, and buildings which encompassed seven stables, six cow houses and numerous other animal houses. Warrnen's Court was requisitioned by the (British) army during the Irish war of independence. Lady Warren and Sam Hunter the estate steward opposed it on the grounds that the local battalion would destroy the house. This was proven to be correct when, after a column of soldiers were spotted on the estate, Warren's Court was burnt to the ground on the 17th June, 1921. Sir Augustus Digby, 7th Baronet, who by this time was living in India, never returned to Ireland. He sold the estate to its present owners’ descendants about 1922, thereby ending an association of two centuries between the Warren family and Cork. THOMAS BERESFORD (-1473), seated himself at Newton Grange, Derbyshire, where he was resident during the reigns of HENRY VI and EDWARD IV; the former of whom he served in his French wars, and, according to tradition, mustered a troop of horse at Chesterfield, consisting alone of his sons and his own and their attendants. HUMPHREY BERESFORD, who eventually became of Newton Grange. MICHAEL BERESFORD, was an officer in the Court of Wards, and seated at Oxford, and The Squires, Kent. TRISTRAM BERESFORD (1574-), the third son, going into Ulster in the reign of JAMES I, settled at Coleraine, County Londonderry, as manager for the Corporaton of London during the plantation of Ulster. SIR TRISTRAM BERESFORD, Knight, of Coleraine, MP for Coleraine, 1634-66, who was created a baronet in 1665, denominated of Coleraine, County Londonderry. SIR TRISTRAM BERESFORD (1669-1701), 3rd Baronet, MP for County Londonderry, 1692-9, who commanded a regiment of foot against JAMES II, and was attainted by the parliament of that monarch. Susanna Catherina; Arabella Maria; Jane; Aramintha. SIR MARCUS BERESFORD (1694-1763), 4th Baronet, MP for Coleraine, 1715-20, who married, in 1717, Catherine, only daughter of James, 3rd Earl of Tyrone, and in consequence of that alliance was advanced to the peerage, in 1720, as Baron Beresford, of Beresford, County Cavan, and Viscount Tyrone; and was created Earl of Tyrone, 1746. A mural plaque in Coleraine parish church was restored by the 1st Baronet's descendant, Henry, 3rd Marquess of Waterford. In 1872, John, 5th Marquess of Waterford, sold 40,000 acres of Beresford property in County Londonderry, 8,000 acres being acquired by the Beresfords of Learmount. The present Marquess of Waterford is the 12th Beresford Baronet. First published in February, 2011. On Sunday, the 21st August, 2016, I paid my very first visit to Wallace Park in Lisburn. It was presented to Lisburn by Sir Richard Wallace, 1st (and last) Baronet, whose residence, Castle House, adjoined the grounds. This is a wooded, twenty-five acre, public park at the northern side of the town, with an ornamental duck-pond and playing-fields. Wallace Park has several drinking-fountains with four female caryatids supporting a domed top. In fact Sir Richard had fifty of these fountains manufactured - in French Renaissance style - to commemorate the end of the Siege of Paris in 1871. He presented them to many major cities, including London, Paris, Rotterdam; and even Canada, South Africa and Brazil. The Hertford Estate, centred round the area known as Killultagh at Lisburn, was one of the largest estates in County Antrim and, indeed, Ulster. Sir Fulke Conway, ancestor of the Marquesses of Hertford, founded Lisburn. Sir Richard's residence in Lisburn, Castle House (above), is a large, imposing mansion of 1880, though he rarely stayed there. At the time of writing (August, 2016) it appears to be unoccupied and there is a skip at the porch. Sir Richard became MP for Lisburn in 1873 and served until 1884. In November, 1882, Sir Richard presented the Castle gardens and outer grounds to the Lisburn Town Commissioners. for several months past a number of men have been employed by Sir Richard Wallace in levelling and laying out the grounds ... they afford means of recreation to all classes, and more especially to the large numbers of operatives, who, pent up in the mills and factories during the day, enjoy the pure air for some hours every evening and thus add immensely to their general stock of health. expended a very considerable amount in ornamenting, railing-in, and making roads through the grounds, as well as erecting very commodious residences for the caretakers. There is a pair of lodges of ca 1884 at each end of the park, intended to provide accommodation for park wardens. SIR RICHARD WALLACE became the principal benefactor of the city, paying for the improvement of water supplies as well as the building of Assembly Rooms, a court house (now demolished) and a school, which survives as Wallace High School. 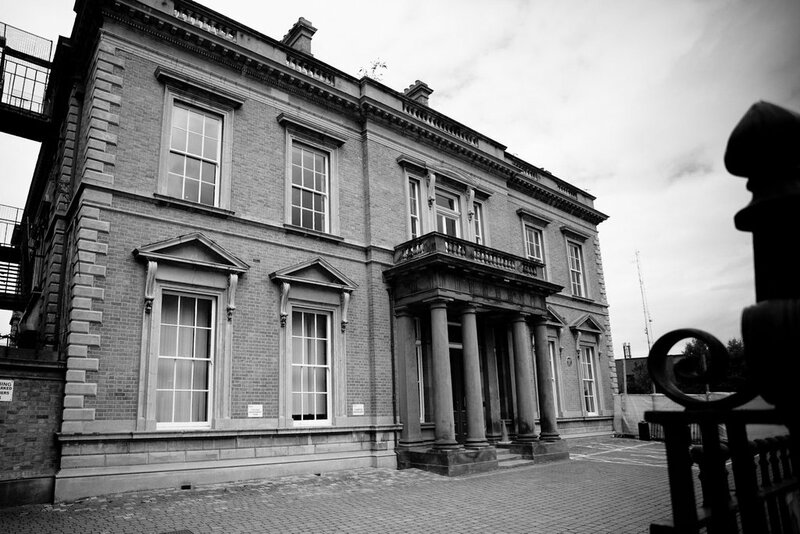 Sir Richard also employed the architect Thomas Ambler, who had remodelled Hertford House for him, to build Castle House in Lisburn. He had hoped that his son Edmond would take up residence in Lisburn, but this was not to be. Castle House was seldom used. After his death in 1890, the citizens of Lisburn erected a magnificent monument to Sir Richard in Castle Gardens, where one of two Wallace fountains in the city may also be found. CASTLE GARDENS is situated on a slope directly opposite Castle House between Lisburn Cathedral and the River Lagan. These gardens retain a section of the gateway of the former 17th century Castle, destroyed by fire in 1707. As the castle was never rebuilt, part of the area was developed as a public pleasure ground, so there is a long tradition of public access. elegantly laid off, with walks, shrubberies, &c and are always in the best order. The fine lofty plantations (beautifully foliaged in almost all seasons) along the sides of the centre grant walk, give a majesty and a sweetness to the whole. He also remarks on the fine views of the River Lagan from the steep terrace, maintained with grass and steps today. The gardens on the top of the hill today, level with Castle Street, were much as Bayley described until extensive archaeological excavations and conservation, supported by the Heritage Lottery Fund, were undertaken in 2004. The four notable 17th century terraces, three of which are of brick, with double-flight perron, bowling-green and banquesting pavilion, have been cleared and excavated for presentation to the public. The Victorian municipal gardens have also been restored; including an avenue of mature trees, lawns, flower beds and two fountains of note; a Wallace fountain of 1872; and the Egret Fountain of ca 1870. A portion of the 17th century Castle gate still exists. There is a monument to Sir Richard Wallace of 1892, and a mounted gun, captured at Sebastopol and erected on the site in 1858. Sir Richard's name survives elsewhere in Lisburn, in Wallace High School, Wallace Park and even in a recently opened shopping centre, Wallace Colonnades. Wallace Park is a public park comprising about twenty-five acres, created on land presented to the people of Lisburn by Sir Richard Wallace in 1884. The area was formerly the outer park for Castle House, his Lisburn residence. He also furnished it with a bandstand, gates and two gate lodges. The duck pond was created from what was formerly a town reservoir. There are mature trees and further planting has been undertaken. Most of the grounds are grassed, the northern part consisting of tree-lined paths, and the southern end is occupied by sports fields. Sir Richard died at Paris on the 20th July, 1890. This family was originally from Makeney in Derbyshire. CAPTAIN EDMUND BLOOD (-c1645), of Kilnaboy Castle and Bohersallagh (Applevale), County Clare, an officer in the Army, went to Ireland about 1595. William, of Dunboyne, County Meath. Thomas, the third son, was father of COLONEL THOMAS BLOOD, of Sarney, County Meath, who attempted to carry off the Crown Jewels. His estate in Ireland was forfeited, but he had a pardon and pension from the King. Elizabeth; Jane; Anne; Mary; Fanny; Nicola. Sir Bindon sold Cranagher House in 1905. Sir Winston Churchill, who served under Blood on the North-West Frontier in 1897, dedicated his first non-fiction book, The Story of the Malakand Field Force (1898), to "Major-General Sir Bindon Blood, K.C.B., under whose command the operations therein recorded were carried out; by whose generalship they were brought to a successful conclusion; and to whose kindness the author is indebted for the most valuable and fascinating experience of his life".